Zebra 110Xi4 - Ethernet, USB, Serial, Parallel connectivity, Rewinder, 203 dpi, 14 Ips, Direct Thermal, Thermal Transfer, 4.09" Max Print Width, Battery. The workhorse of the Xi product line, the 110Xi4 was built on the legacy of the Xi series of products. The 110Xi4 was developed to improve overall operational productivity and efficiency in a variety of environments. Built RFID Ready (Requires upgrade kit), the 110Xi4 allows you to upgrade to RFID technology in the future, providing solid investment protection. Please contact PTS for additional configurations and volume pricing. 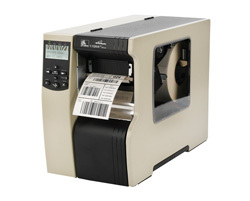 PTS carries the complete line of Zebra barcode label printers. Note: This printer has been replaced by the ZT610 series. Only available while supplies last. Your Zebra 110Xi4 Barcode Printer comes with a limited 1 year warranty that protects you from manufacturer defects only. That does not cover normal wear and tear and any damage you do to the printer. That is where Zebra OneCare Essential Service comes in. This service covers your 110Xi4 printer for an additional 2 years on top of the existing 1 year warranty, with hassle free repair service keeping your printers operating at the high performance levels you have come to expect from your Zebra products. Do I need software for my Zebra 110Xi4 to print barcode labels? Although you may be able to integrate this printer with existing systems, PTS recommends Seagull Scientific's Bartender software for designing and printing your barcode labels and receipts.